So, we will start with setting up the Log4j for our project. Copy below code in “log4j.properties” file. you will need Apache commons logging jar, which you can find in this article’s source code. # A default log4j configuration for log4j users. # directory. You are also encouraged to edit it as you like. oauthURL = sfdcInstance + "/services/oauth2/authorize?response_type=code&client_id=" + consumerKey + "&redirect_uri="
Above servlet is starting/landing servlet and authenticate your application with Salesforce using Consumer Key and Consumer Secret. 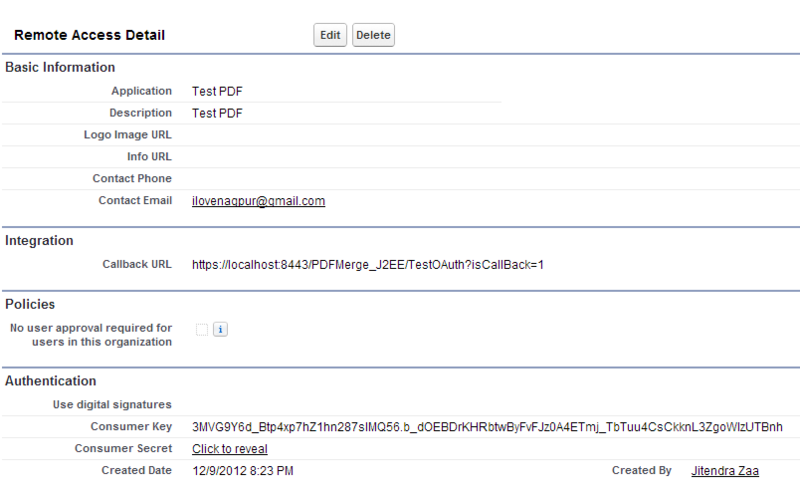 After Authentication using OAuth it will call another servlet to merge PDF and save back in Salesforce. Now, create a new Servlet which will actually read the attachment Ids from parameter and merge PDF using “iTextPDF” jar and save back again in Salesforce. you will also need to map the Servlet URL in “web.xml” file, which you can find in source code attached. To run above application, enter this URL in address bar “https://localhost:8443/PDFMerge_J2EE/“. 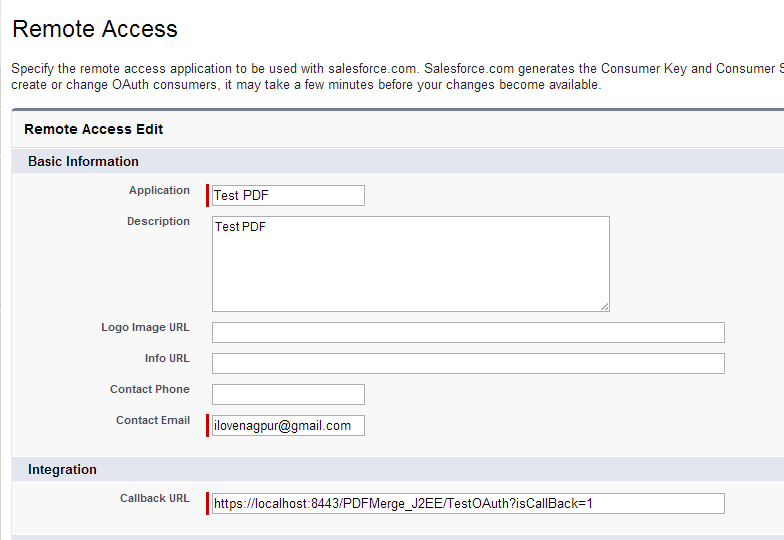 After running above code, first time it will ask you to enter the username and password of salesforce account to allow access to your local application and then it will get all the attachments specified in code and after merging it will again attach it to parent id passed in parameter. i am new to salesforce i am confuse about its future scope currently i am small company having 15 employees??? I don’t have knowledge in java or .net or html,I want to learn salesforce crm to start my career in this. Can i go with this? How much part of coding is for a developer and administrator? sir .can you please provide the equivalent description for connectivity through window phone 8. Sorry to say but i have not tried like this. You can try to check Mobile SDK of SFDC. Very useful post. Question: Where is the Salesforce class used below located? Complete Source code is not posted in this article, Please download zip file from link available at end of this post. when comes to the concept of whitelisting , they wont whitelist the ip ranges of salesforce , as it is not static, and for the security reasons..